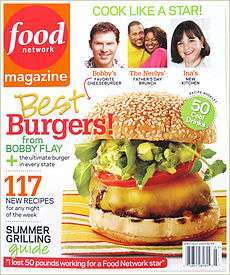 In October 2008, Hearst President Cathie Black announced that Hearst Magazines had partnered with Scripps Networks Interactive to develop Food Network Magazine. Maile Carpenter, who was working at Everyday with Rachael Ray, is the magazine's founding editor. The magazine started out with a 300,000 issue rate base guarantee to advertisers. Due to the significant growth of interest and subscribers generated by internet sales and television, that guarantee increased to 1.25 million after 9 issues in 2009-2010. Each issue features various Food Network talent throughout its pages, plus a behind-the-scenes look at their shows and kitchens. The magazine also showcases kitchen tools, food products, new restaurants, recipes and food across the United States. Chefs that have been included in Food Network Magazine include Alton Brown, Guy Fieri, Bobby Flay, Ina Garten, Michael Symon, Melissa d'Arabian, Rachael Ray, Tyler Florence, Ellie Krieger, Ted Allen, Morimoto, Aida Mollenkamp, Anne Burrell, Aarón Sanchez, Jose Garces, Pat Neely, Sunny Anderson and Nigella Lawson. Accolades earned by the magazine include being named "Launch of the Year" by Folio, Advertising Age and Min. In April 2010, Food Network Magazine was listed as #1 on Adweek's Hot List "10 under 60" for their first eligible year. ↑ "eCirc for Consumer Magazines". Audit Bureau of Circulations. June 30, 2011. Retrieved December 1, 2011. ↑ David E. Sumner (May 2012). "American winners and losers:2001 to 2010" (PDF). International Conference on Communication, Media, Technology and Design. Istanbul. Retrieved June 25, 2016. ↑ "Food Network Magazine". Hearst Publications. Retrieved 12 December 2015.